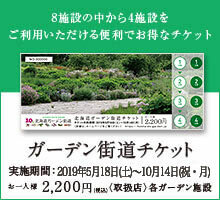 This year we also started selling Hokkaido Garden Road tickets. It is a ticket window at 8 one garden on the Hokkaido Garden Highway, and it sells during the period. 8 It is a great ticket that you can enter the garden of your favorite 4 place from one garden. The expiration date is up to 1 5th of October this year, so you can enter the 4 site separately during the period. However, you can not enter 2 times or more in the same garden. Please certainly purchase this ticket 2 sheets and visit 8 one garden.